In 1983, I was given a Minolta Weathermatic for my birthday and it changed my life. 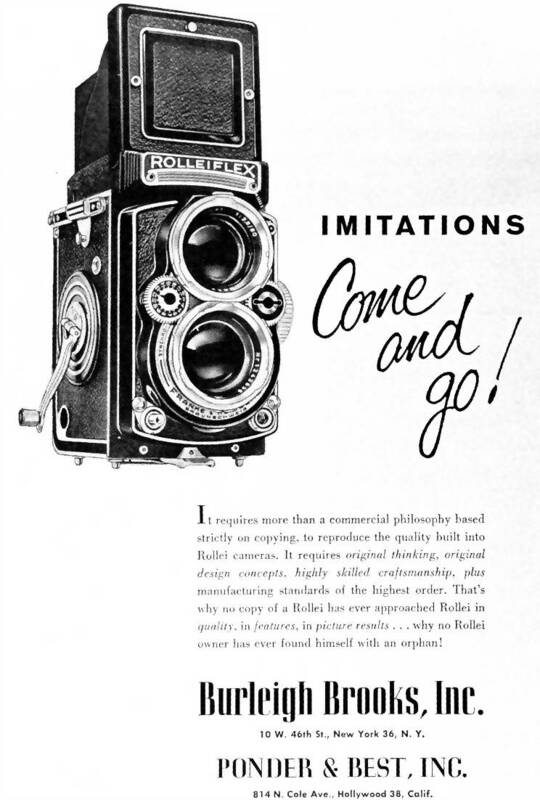 What was it that fascinated me about the pictures made with this little yellow, instamatic, waterproof camera that has inspired me to photograph in and around water for 25 years? First, I shot black and white pictures underwater of children at play in pools, enlarging them to 20×24 inch prints. In those pictures I saw something unfamiliar and exciting. My perception changed and I discovered a newly transformed world of possibilities. The nature of water is infinite and in a constant state of flux. It struck me that through those pictures I captured fleeting moments of perfect harmony that were as temporal as the life of a bubble. On a recent trip to one of my favorite childhood haunts, the newly redesigned dinosaur hall at the Carnegie Museum of Natural History in Pittsburgh, a particular exhibit struck me. It was a magnificently designed underwater ocean scene. 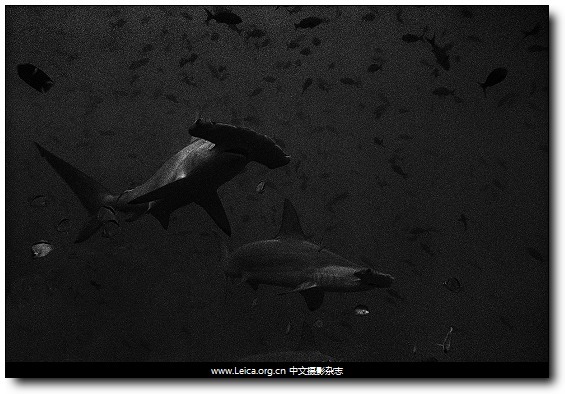 It was dark and dramatically lit reproducing the motion and quality of light above deep waters. The whole food chain was represented from scores of small fish hiding for protection in one massive bait ball to the largest creature overhead, the tylosaurus. The drama of life and survival was unfolding. What blew me away was the caption, which read “The scene before you represents a moment in time about 83 million years ago in what is now “Western Kansas”. Dark Sharks and Light Rays are photographed in places that remind me of “Western Kansas”. 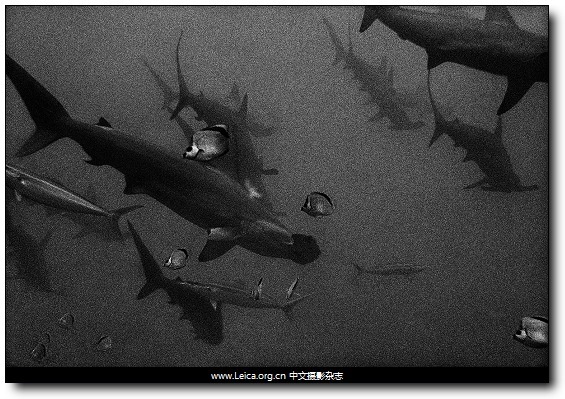 Water still covers most of the planet: sharks and rays have been swimming on this Earth for eons. 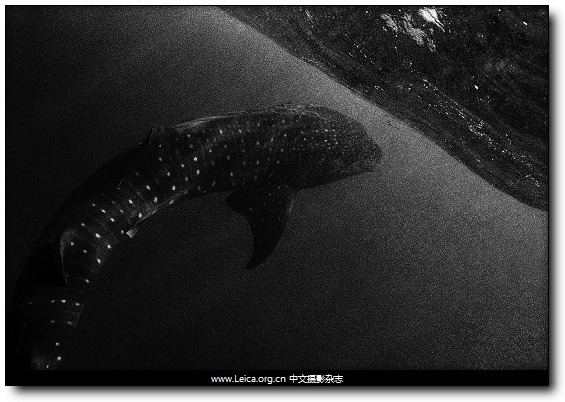 These creatures are closely related and prehistoric, so are the waters in which they swim. 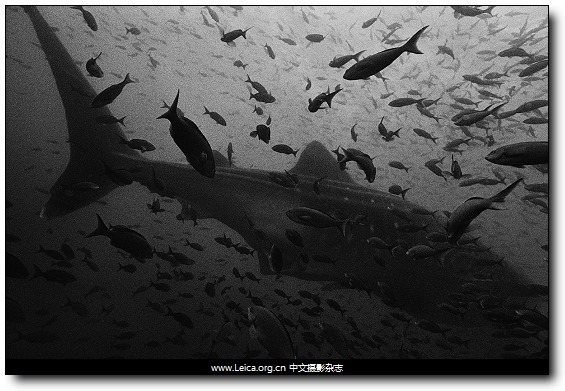 However, my locations, in Pacific waters off the Americas, though remote (one destination takes 32-36 hours to reach by boat), are deeply affected by many modern threats including: over fishing, illegal fishing, and shark fining. 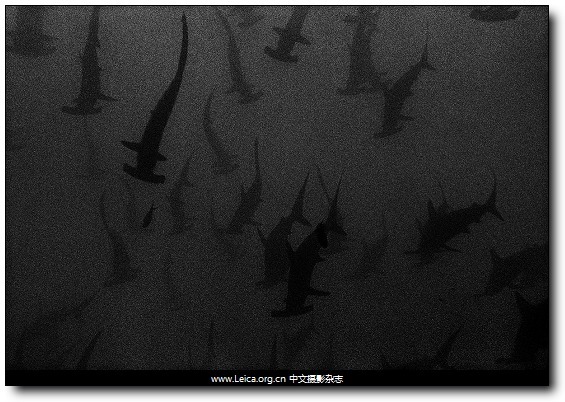 The shark population is plummeting and rays are following suit. It is not inconceivable to think they might follow the dinosaur into extinction. These photographs are not the typical slicked up representation of the underwater worlds often found in scuba magazines. 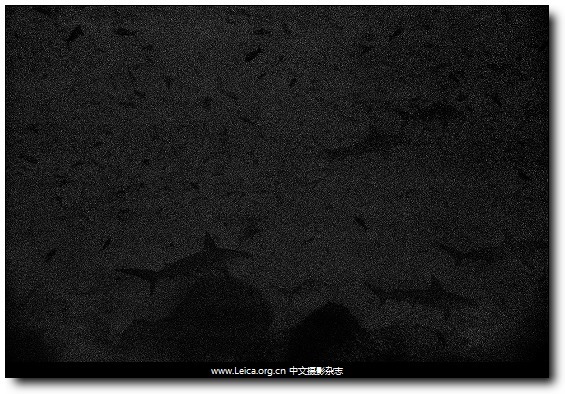 For example, the Dark Sharks are rendered in a way that is kindred to that of cave paintings. Our feeling towards these primeval animals comes from deep within our most primitive selves. 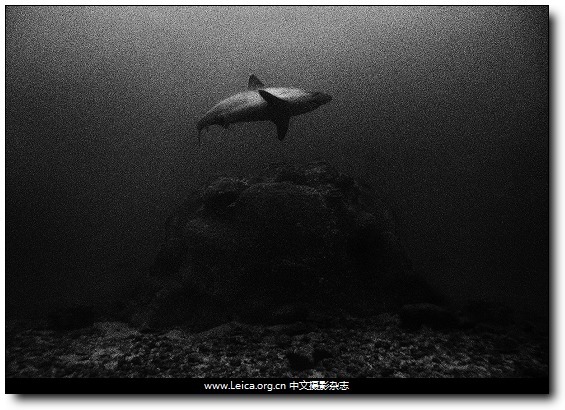 The seas are often roiled and filled with current when the sharks are around but water has boundless variations and it is in a constant state of transformation. When the wild ocean calms, the flow between these intertwined series occurs organically, often on the same dive. 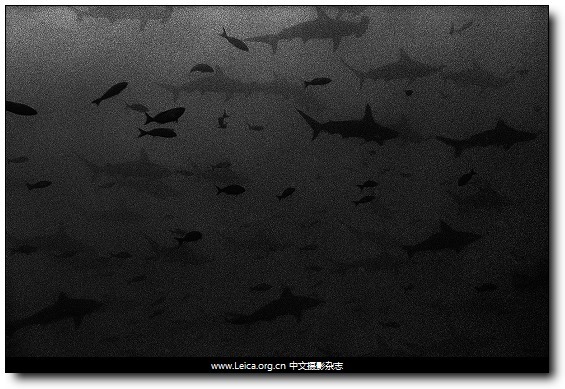 The Light Rays are a counterpoint to the Dark Sharks. 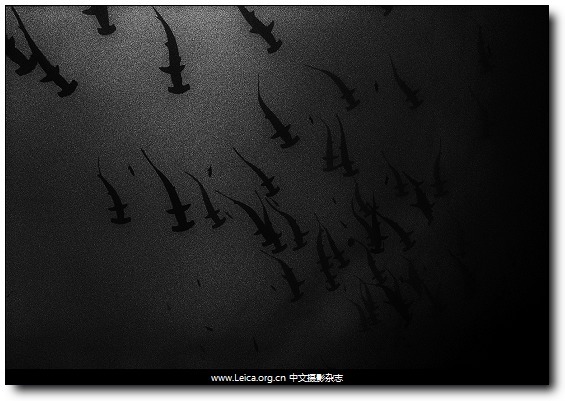 Where the Dark Sharks ask the viewer to bear witness to the power and visceral essence of the ocean, the Light Rays printed like graceful etchings represent the “Zen” of the ocean, and its peaceful, meditative qualities. But water is forever fickle; so occasionally and unexpectedly the line between the two groups is blurred by the whims of the sea. These photographs provide a unique view – shot from a vantage point unfamiliar to most. The pictures lie in the realm of where natural history gives way to the ineffable. They are hard to classify but their subject is relevant and matters. Water is life’s stage and for as long as the stage door has been open to us, it has excited our creative and spiritual expression. The allure and mystery of these waters and the complicated puzzle of their continued existence inspires these pictures and continues to summon you and me to look even deeper. WOW ! 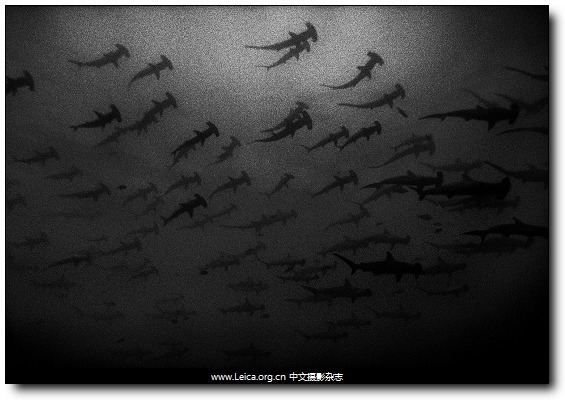 Shark infested waters, now that’s extreme photography.